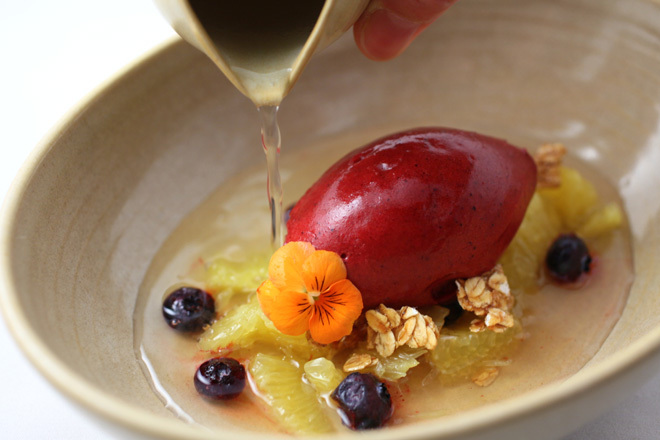 Getting a glimpse into the mind of a chef is always a treat. 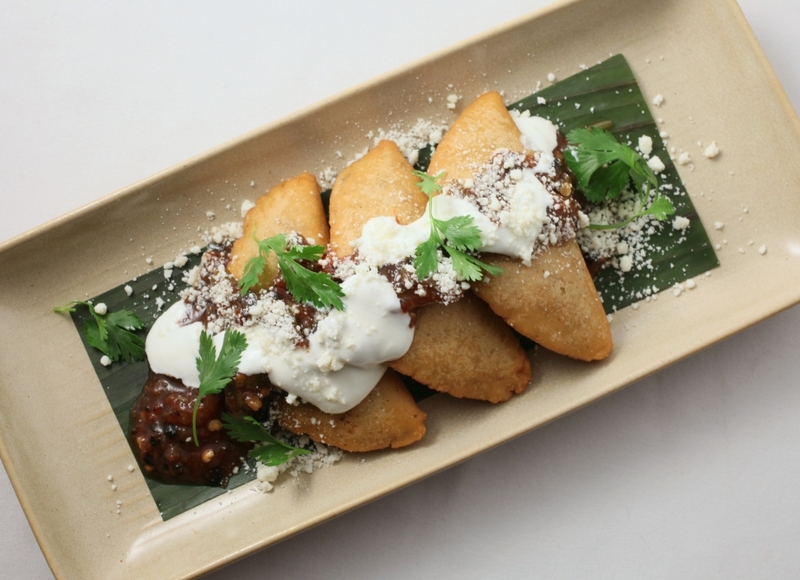 Earlier this week we caught up with Richard James, Chef de Cuisine at Frontera Grill, immediately after a staff tasting of his newest additions to Frontera’s May menu, which he said celebrates the arrival of springtime, highlights new seasonal dishes and resurrects an old Frontera favorite. Chicken in Asparagus Crema / Smoked Gunthorp chicken breast, roasted poblano-asparagus crema, roasty local asparagus and Yukon gold potatoes. Crispy chicken chicharrón. 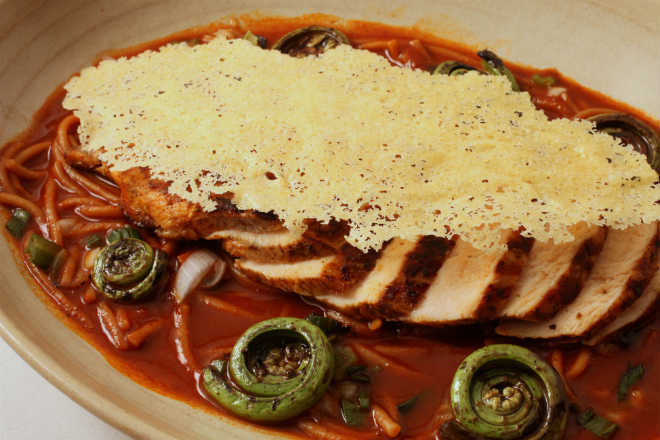 “The whole dish is funky and interesting and likes to play with your entire pallet. It took me probably three days to come up with this. It’s something we’ve never done before. Apricots and tomatillos go well together, the sweet and the tangy. I wanted to take that sauce and make it really, really interesting. 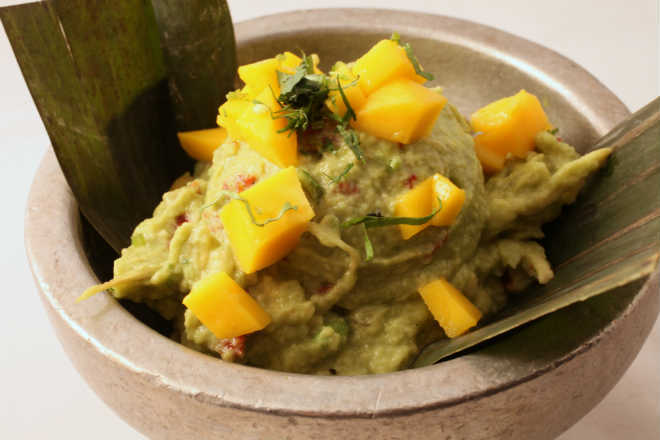 There are floral qualities in habanero chiles, and they go really well with things like tropical fruits, and apricots are like our version of a tropical fruit. 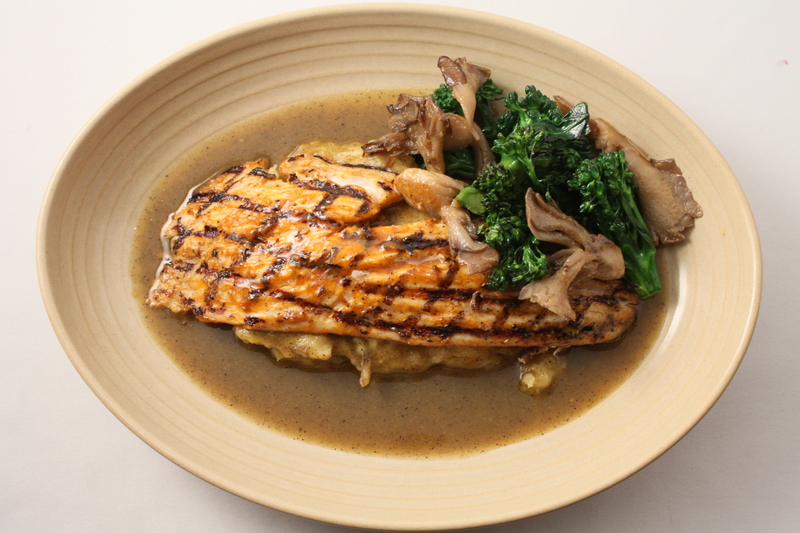 So then I wanted one more level of scent, so I scented the sauce with chamomile. It all goes really, really well together. 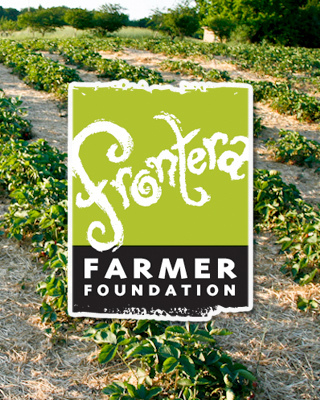 Chicken fideos and hoja santa tres leches: It’s Frontera’s May menu! 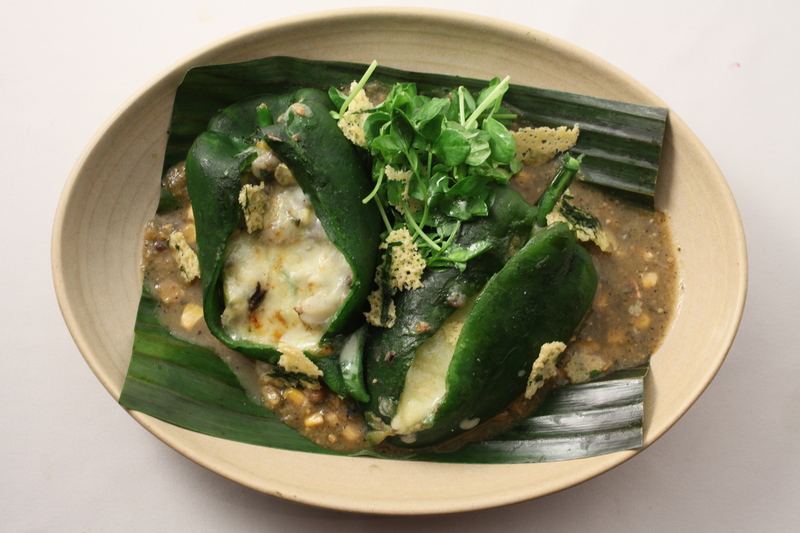 Swiss Chard Tamales Fresh corn masa tamales flavored with local Swiss chard, serrano chiles, cilantro and parsley. 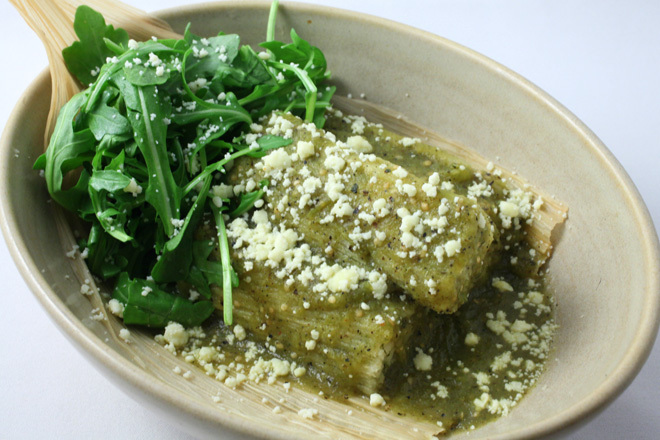 Tangy tomatillo sauce, homemade fresh cheese, arugula salad. 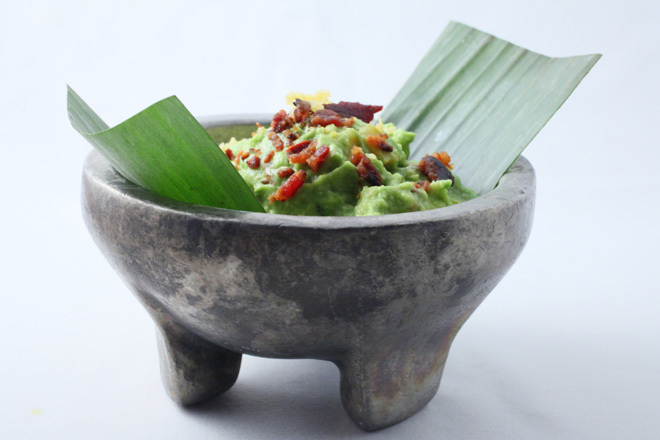 Bacon Guacamole, Fall Version Michoacan avocados, smoky morita chile, crispy Gunthorp bacon, bits of brown-butter butternut squash, grilled knob onions, dry Jack chicharrón. 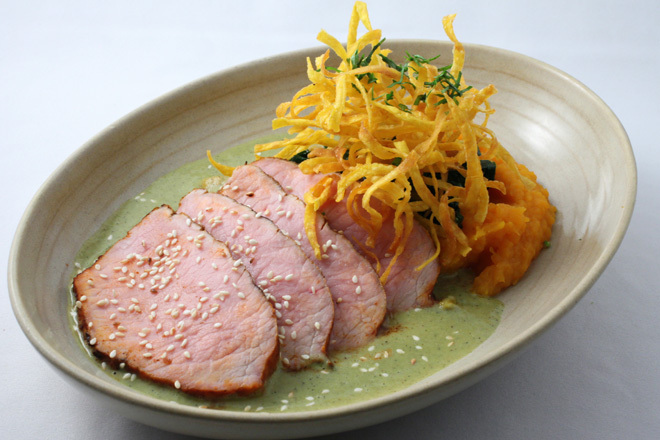 breast, salsa huevona, housemade crema, Indiana Jack cheese, kale, tatume squash. 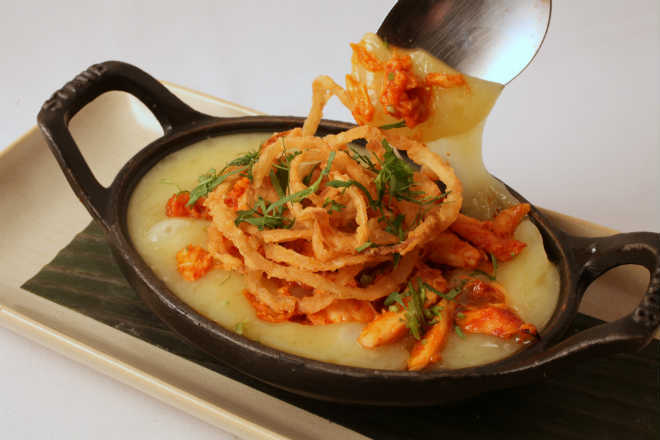 Skirt Steak Queso Fundido Wisconsin Organic cheddar, herby grilled skirt steak, pickly chopped salsa, Mexican cincho cheese. 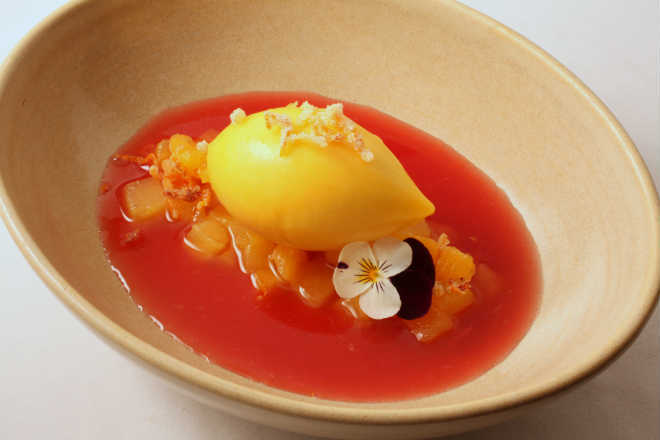 sour orange and epazote. Tomato-habanero sauce, xnipec salsa. 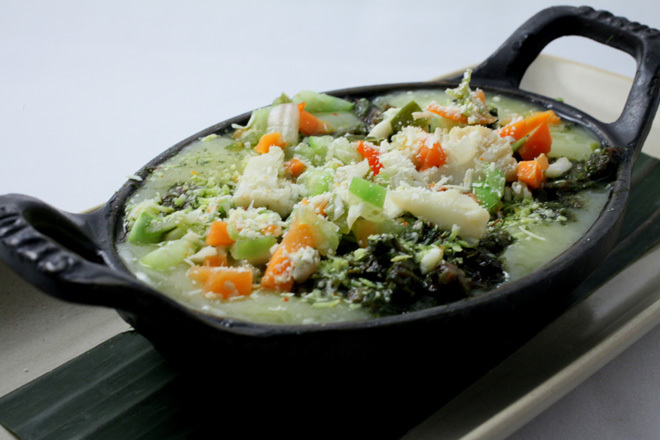 braised black kale, crispy butternut ribbons. 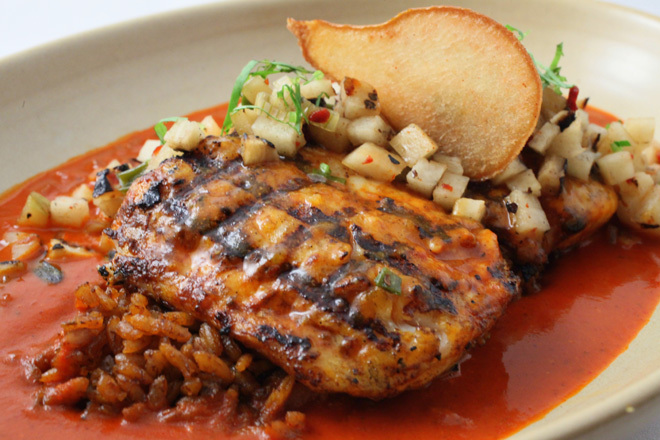 guajillo-pear sauce, red chile rice, grilled pear salsa, pear chips. 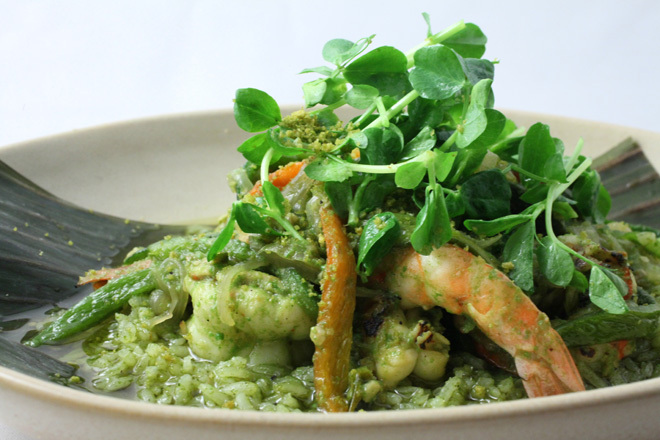 Shrimp Mojo de Ajo Spicy grilled fresh Gulf shrimp, mojo de ajo, herby green rice, poblano chile, Three Sisters Garden pea shoots, shrimp crunch. 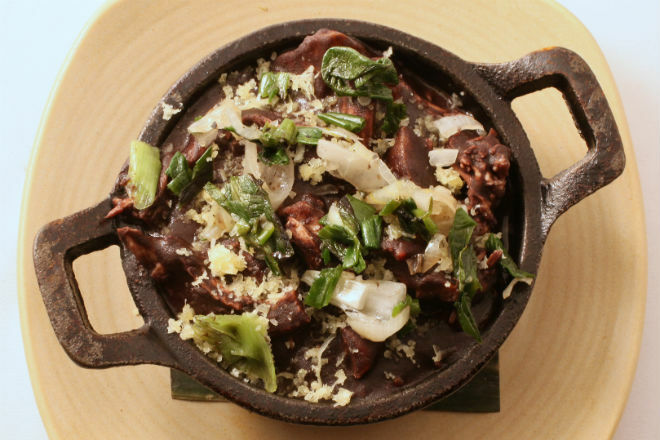 chile and huitlacoche, crispy tortitas, grilled green beans, pickled local wild mushrooms. 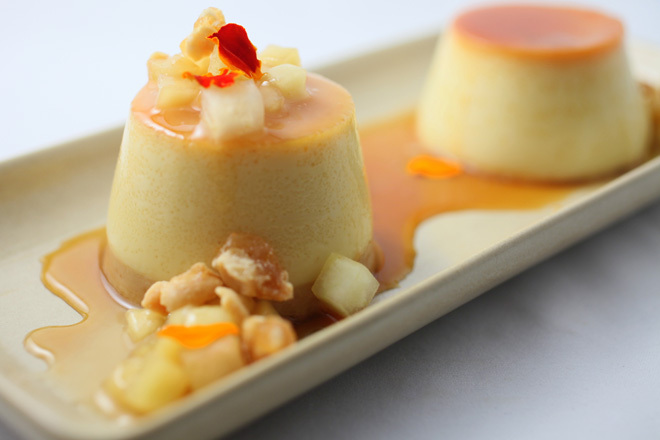 Duo de Flanes Traditional Mexican vanilla flan and creamy peanut butter flan. Nichols Farm apples two ways, caramelized peanut crunch. 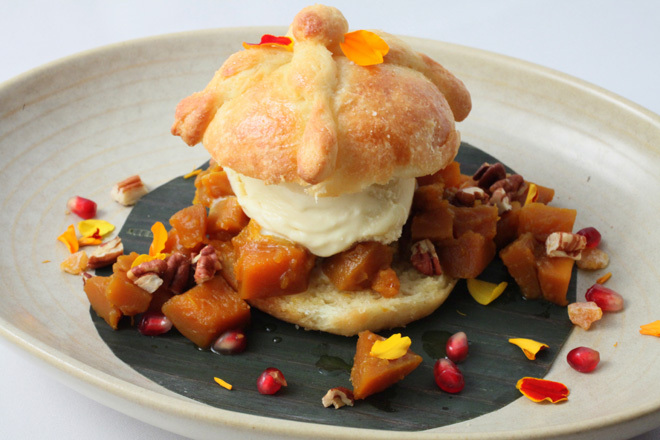 local pumpkin and toasted pecans. 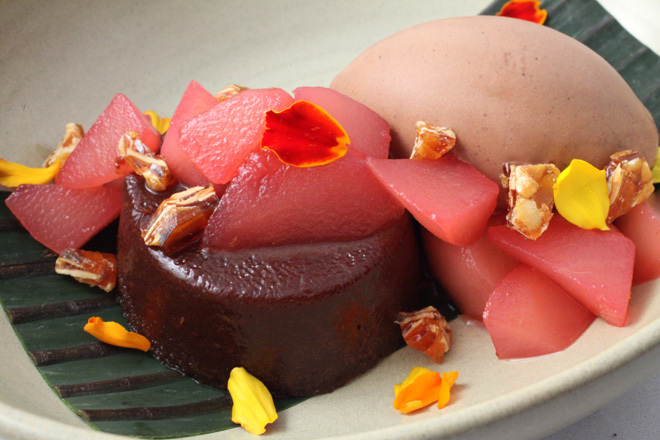 Boca Negra Gooey chocolate ganache cake, hibiscus poached pears, Mexican chocolate ice cream, chocolate crumble, almond brittle. 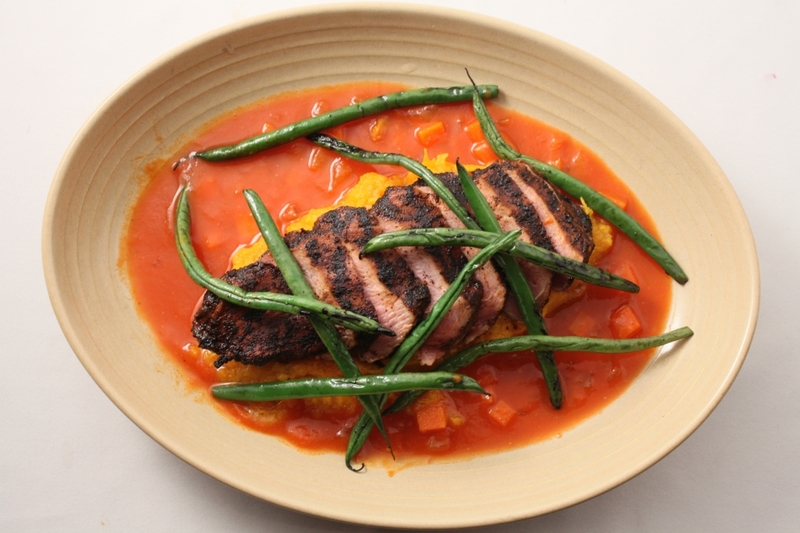 Those crispy, bacon-stuffed tortitas that come with the pork. 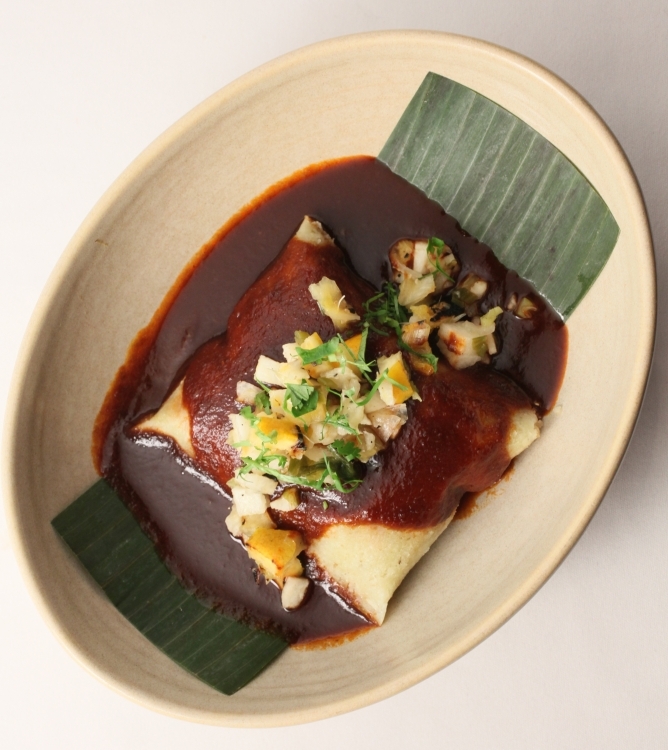 The duck carnitas stuffed in the tamal. 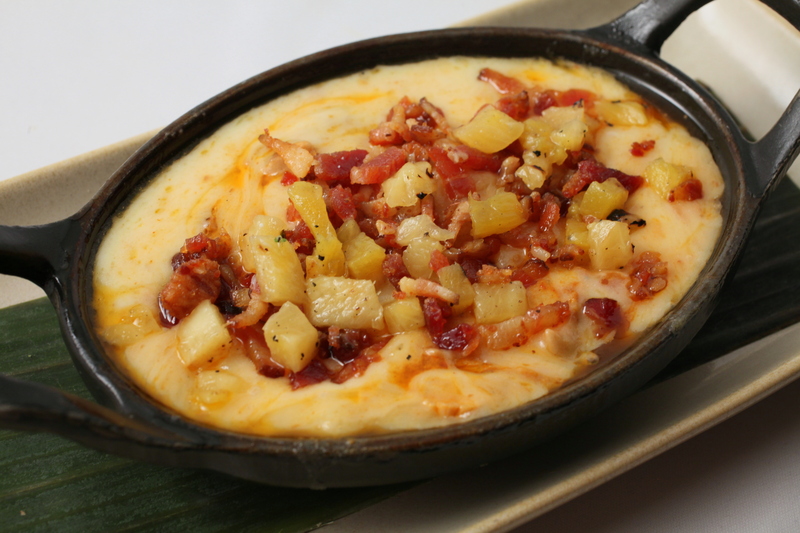 We repeat: The above list is incomplete. But scroll through the photos above and you’ll soon have a long list of your own. If you’ve been to lunch at Frontera lately you’ve probably seen a number of four- and six-tops, groups of people (probably co-workers) drinking margaritas like they’re going out of style (note: they’re not) and in general having a really, really good time—so good that you might wonder how productive they’ll be at work the rest of the day. Lunches like that are awesome. 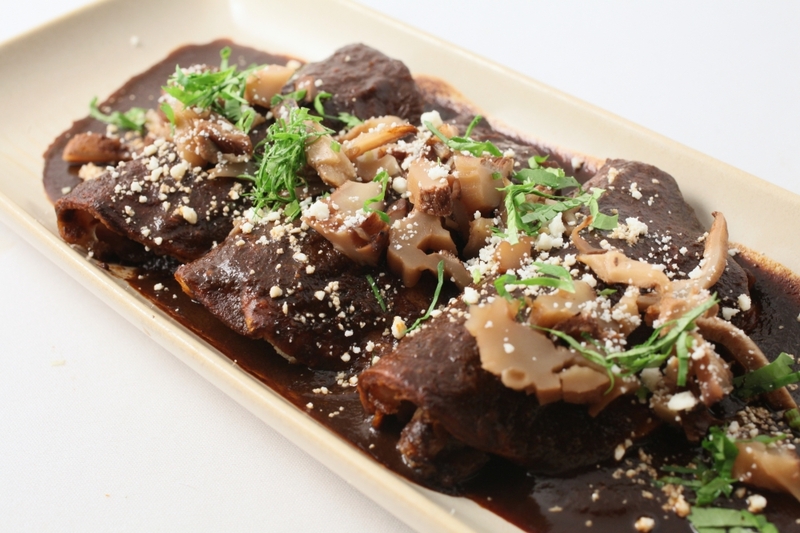 But let’s be real—we can’t spend two hours drinking tequila and eating carne asada every day. 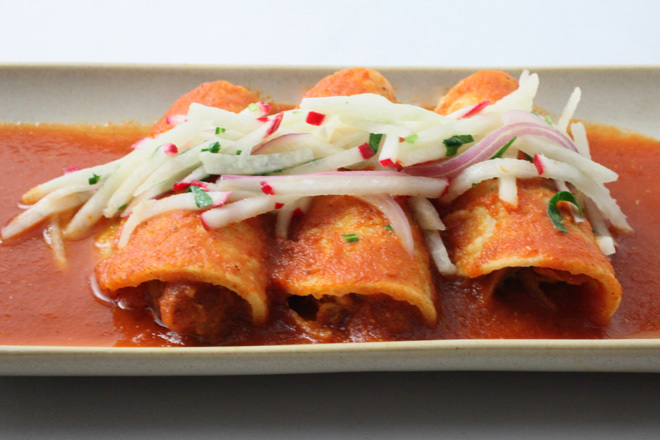 That’s why today we’re launching a new, no-fuss lunch option at the Frontera bar. 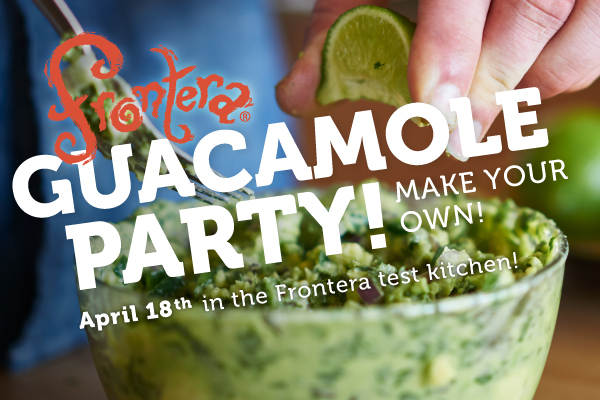 We’re calling it Frontera-on-the-Fly. 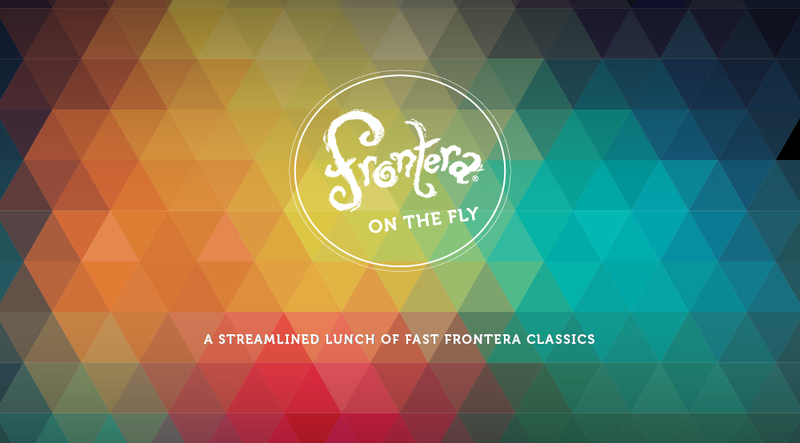 Frontera-on-the-Fly is the kind of lunch you can eat every day. 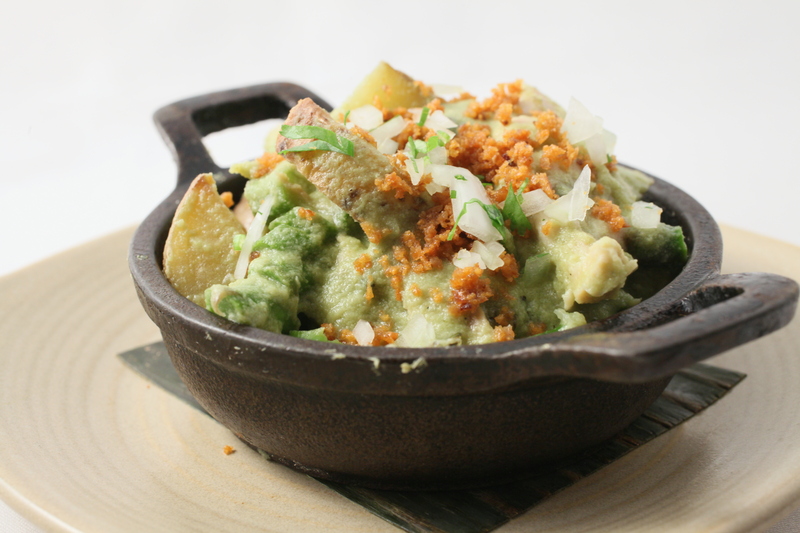 It’s a smaller menu of some of our quicker items: guacamole, ceviche, tacos al carbón. You eat your salad, you eat your tostada, and before you know it you’re back at work. See the new menu below. Or better yet—ask one of our bartenders. 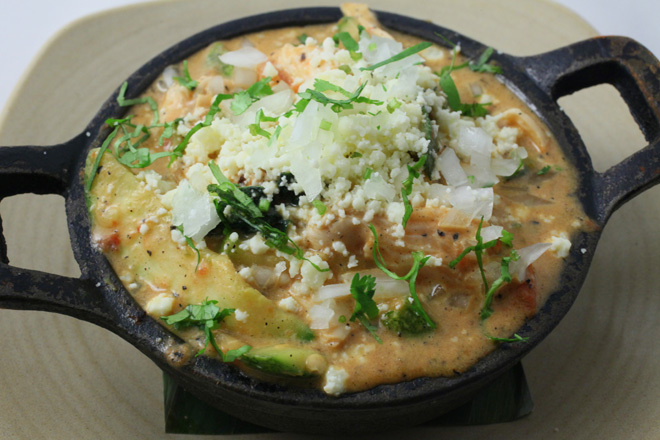 Mango guacamole and oyster mushroom tamals—it’s Frontera’s new spring menu! 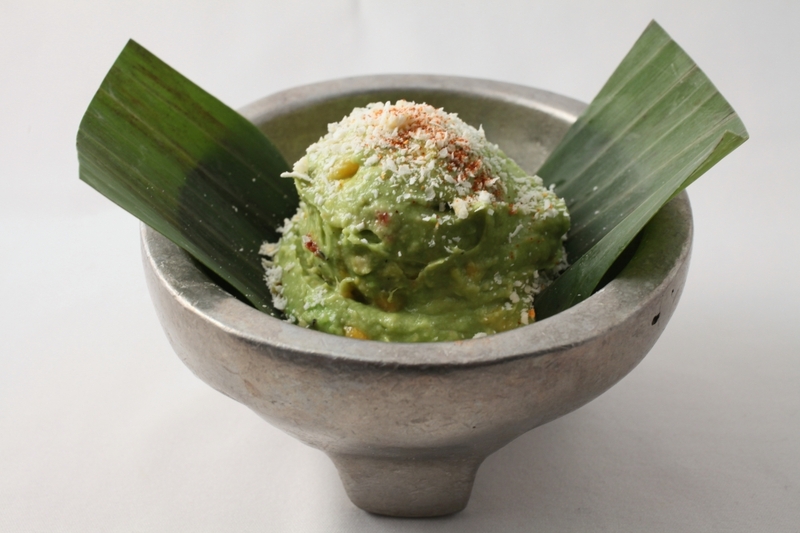 Tropical Guacamole Manila mango, crunchy cucumber, spicy morita chile, smoky onion. 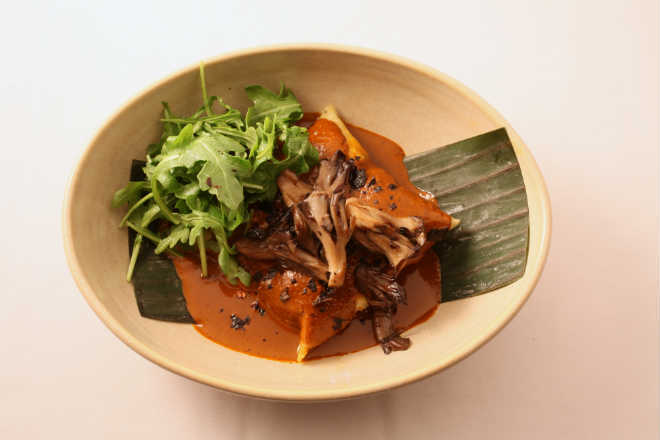 Mushroom Tamal Banana leaf-steamed fresh corn masa tamal, oyster & shiitake mushroom filling, toasty pasilla chile crema, brown butter chanterelle mushrooms, wild arugula. 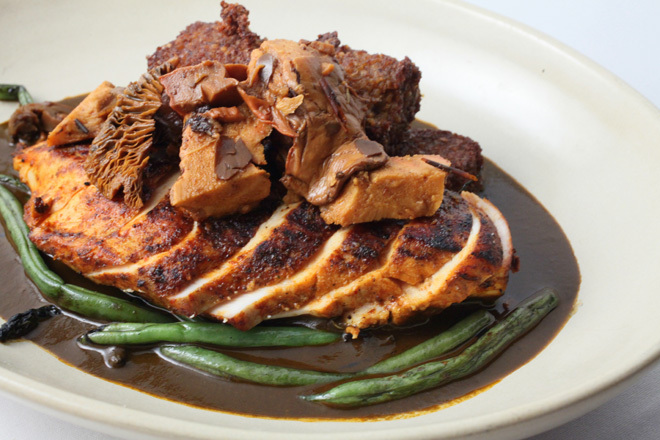 Chicken with Black Bean Sauce Grilled Gunthorp chicken breast, chipotle-black bean sauce, smoked sun-dried tomatoes, roasted potatoes, grilled green onions, Sonoma dry Jack cheese. 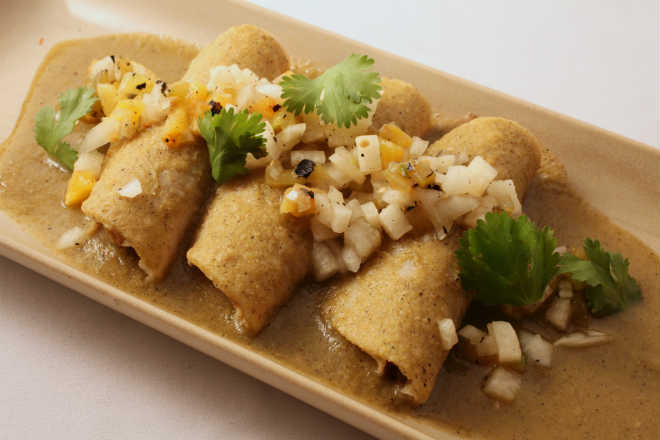 Duck Carnitas Enchiladas Spicy Gunthorp duck carnitas, tomamole (tomatillo, serrano, pineapple, sesame seeds), grilled pineapple salsa (tomatillo, serrano, jícama). 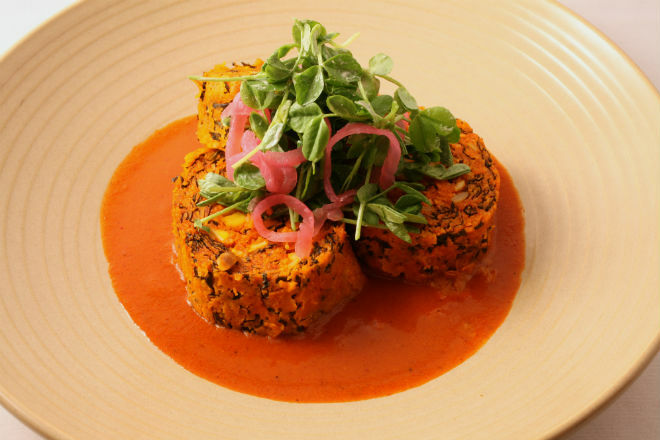 Brazo de Reina Yucatán’s famous giant tamal made with achiote flavored fresh corn masa, Swiss chard, egg, pepitas, Yucatecan pipián, tangy pickled red onions, Tracey’s pea shoots. 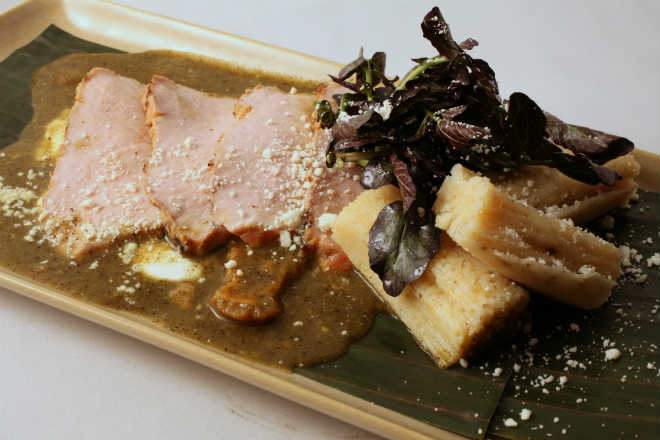 Pork in Tomatillo Garlic-marinated grill-roasted Gunthorp pork loin, tomatillo chicharrón sauce, añejo cheese flavored tamal, homemade crema, red watercress. 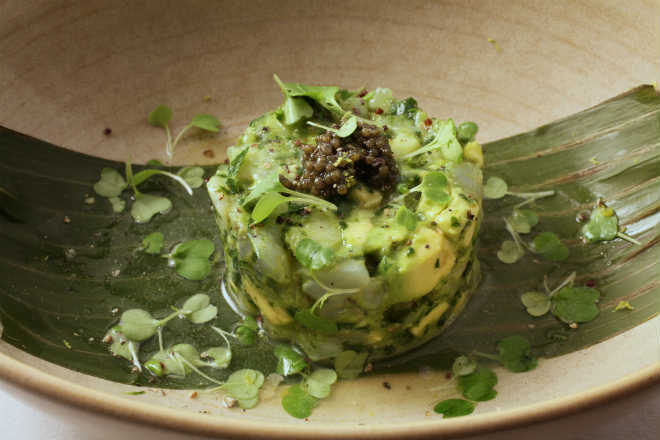 Shrimp in Verde Mexican blue shrimp, adobo verde (cilantro, serrano, garlic, olive oil), cucumber, avocado, lime, Bayless Garden micro greens, American paddlefish caviar. 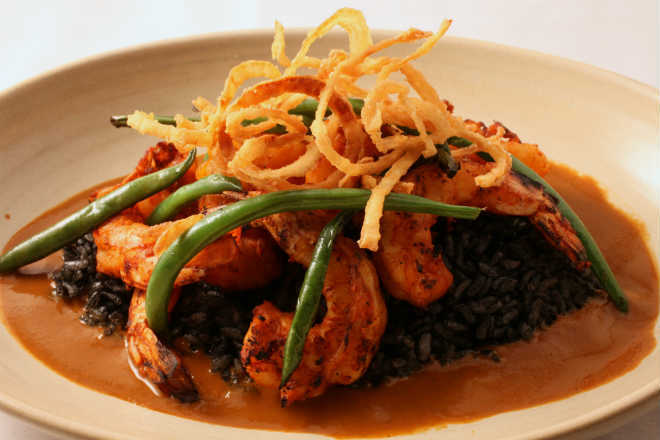 Shrimp in Red Chile Pipián Spicy chipotle-grilled fresh Gulf shrimp, red pipián, black bean rice, limey grilled green beans, crispy onions. 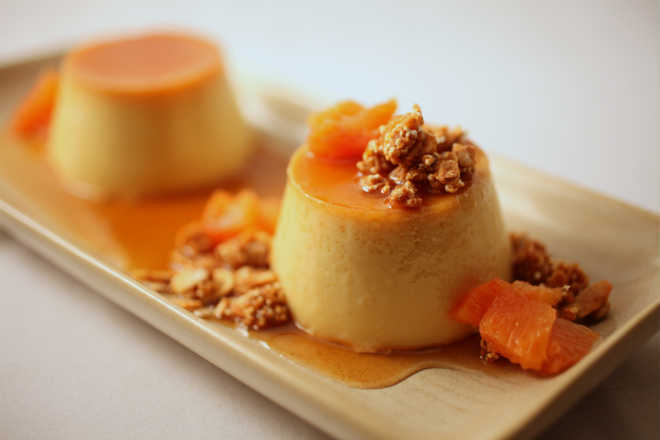 Flan X2 A duo of caramel custards: traditional Mexican vanilla flan & maple flan with toasted oats, amaranth-almond granola, Spence Farm maple syrup drizzle. 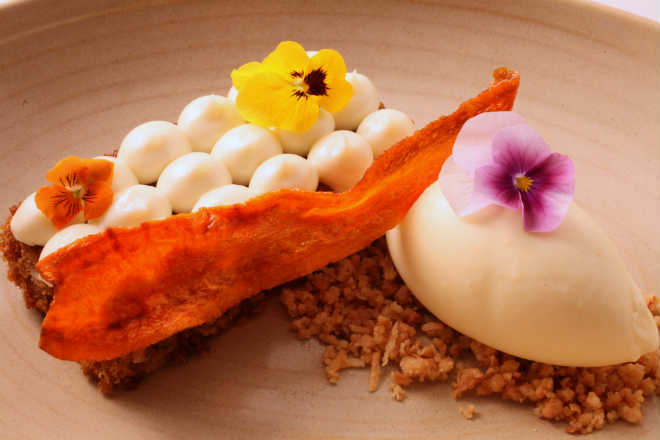 frosting, Xtabentun-cream cheese ice cream, coconut cookie crumble. 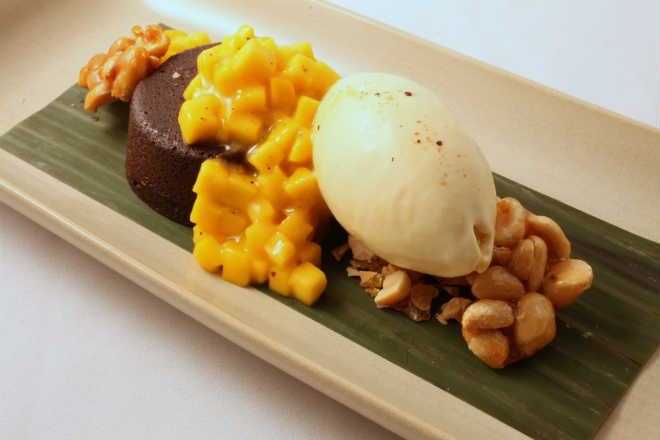 Chocolate-Ancho Fudge Cake Individual, ancho-infused bittersweet chocolate cake, peanut butter ice cream, honey Manila mango, toasted peanut brittle, ancho chile salt.